Right from the beginning we knew that our goals would be hard to reach. As time passed we grew as persons and as an organisation by learning from the experiences of others and with the help of many. Here are our most important milestones. You can see our more detailed archive of rescue missions here. Daily reports of drownings in the Mediterranean. The idea of founding JUGEND RETTET IUVENTA is being developed. Networking begins. A core team in Berlin emerges and a network of ambassadors in Germany is being build. We decide to search for a Dutch fish trawler as our ship. Founding of 'JUGEND RETTET e.V.' (JUGEND RETTET IUVENTA) and official registration in Germany. Start of the fundraising to fund our ship. First visit to a school and start of collaborations with more schools. Joining 'Initiative Transparente Zivilgesellschaft (ITZ)' (Initiative for a transparent civil society) as a member. Proposal for buying the ship. Start of the conversion works on the ship. Naming of our ship: 'IUVENTA'. The IUVENTA is leaving it's conversion harbour in Emden. It's heading to Malta to start the rescue missions in July. Leaving the harbour in Malta to start the first rescue mission - named 'Solidarity' - saving 1388 people. Planning missions for the next year. 6,256 rescued in 7 missions. Start of missions in 2017. Over 10,000 rescued in 8 missions. The accuracy of the displayed position depends on the current reception of the signal, which can be low while on rescue missions. The ship selected to become Jugend Rettet’s active contribution to Maritime Search and Rescue in the Central Mediterranean Sea was acquired in May 2016, converted and refitted by the tremendous effort of many volunteers for her new task and christened IUVENTA. 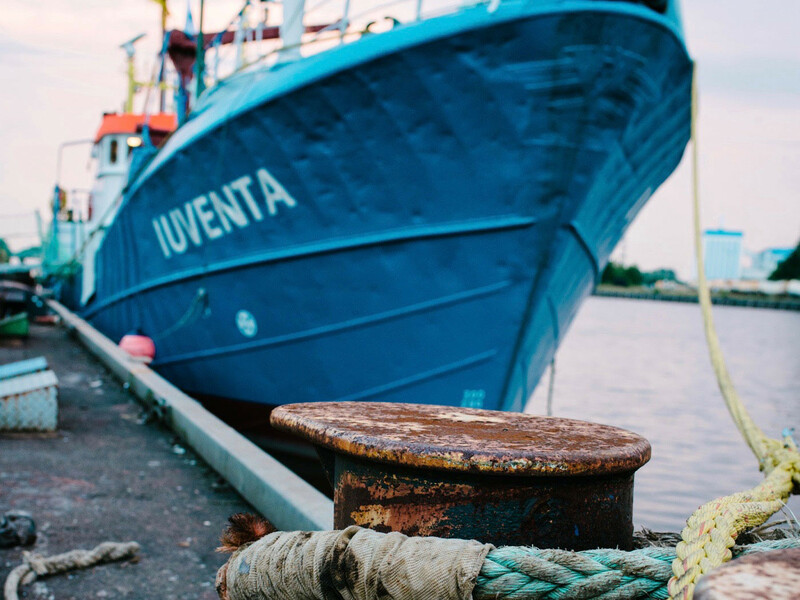 Originally the 33m long IUVENTA was designed as a fishing vessel for the rough and frequently hostile conditions of the North Sea. Redundant features can be found throughout the ship such as two auxiliary engines and design elements of the main engine that ensure continuous operation even in the roughest conditions. The once large deck spaces for working fishing gear was decluttered in the conversion to allow the accommodation of up to 100 rescued persons. Tarpaulins can be arranged to either protect the deck space from the sun or provide shelter from wind and rain. In normal rescue operations the crew complement is between 11-13 persons. Two fast rescue boats (RHIBS) are stored on the main deck which are launched by means of a hydraulic telescopic crane which as replaced for a better model in 2017. Typically for a fishing vessel the freeboard is remarkably low for handling nets which gives two advantages: first, it allows easy launch and recovery of the two rescue boats; second, rescued boats can be taken alongside and persons embarked quickly in a safe manner. On a usual rescue mission the crew consists of at least 13 members. JUGEND RETTET IUVENTA is aware of it's duties as a responsible and trustworthy charitable organisation and takes them seriously. Transparency is important to us. This is why we joined the ITZ (Initiative for a transparent civil society) as a member. This means that we committed to make following information public and to keep it up to date. The organisation ('Verein') 'JUGEND RETTET e.V.' (JUGEND RETTET IUVENTA) was founded October 3rd 2015. Residence and address of the organisation are: Ruhlsdorferstraße 151, 14513 Teltow, Germany. Our statute in it's current form, how it was properly determined by the General Meeting October 3rd 2015 is public here. A summary of the goals of the organisation can be found here. By that our organisation is tax-exempt of corporation tax and business tax. 'JUGEND RETTET e.V.' (JUGEND RETTET IUVENTA) is allowed to issue donation certificates. You can see the current notification here. A summary of the organisation's activities can be found in our Annual Report 2015. Every person involved in 'JUGEND RETTET e.V.' (JUGEND RETTET IUVENTA), as well as all advisors, contribute unsalaried. Our team consists of mainly young persons. Their motivation derives from the will to rescue lives and to improve the humanitarian situation on the Mediterranean. The core team of JUGEND RETTET IUVENTA based in Berlin has 11 members. 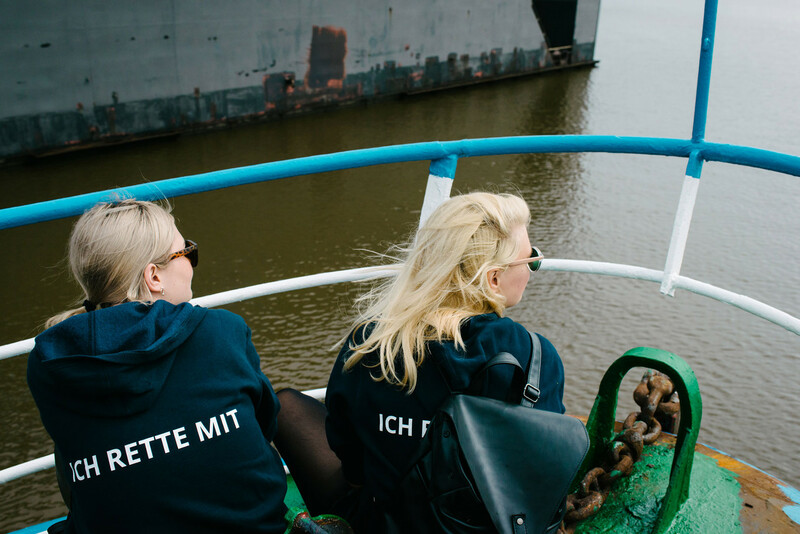 In all of Germany more than 70 people are engaged in our work. You can find a summary on our funding and spending in our Annual Report 2015. There are no relationships with third parties regarding company law. JUGEND RETTET IUVENTA has no supporter or sponsor whose annual payments make up more than 10% of our whole budget. Our work is made possible by the contributions of many.